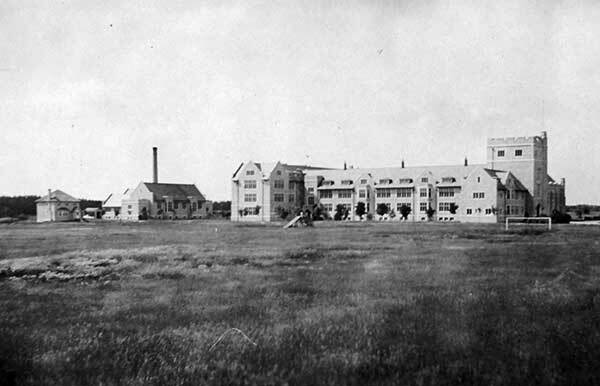 Founded in 1888, the Manitoba School for the Deaf occupied various locations, including the former Manitoba Agricultural College site on Tuxedo Avenue, before transferring to this facility in 1922. 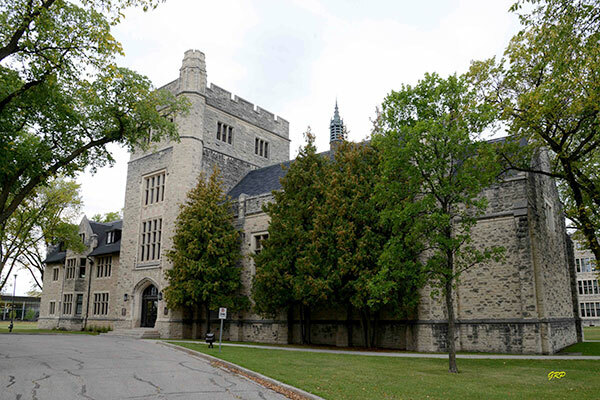 Originally built in 1921 and designed by John D. Atchison and Company, these buildings served as a residential school for deaf students from the prairie provinces until the Second World War when it was used as part of the Commonwealth Air Training Plan. Wireless School No. 3 opened on 17 February 1941, training Wireless Air Gunners as well as Ground Signal Officers. It closed on 31 December 1944 when operations were transferred to the No. 2 Wireless School at Calgary, Alberta. The Royal Canadian Air Force continued used the site for other purposes until 6 March 1945. From 1946 to 1965, the building housed the Manitoba Normal School, a teacher training facility. During that period, five H-huts and a two-storey building on the grounds of the Wireless School were given for a two-year period to the City of Winnipeg for use as emergency housing for around 100 families. School facilities were made available for 45 children in grades 1-6, with those of higher age attending facilities elsewhere in the Winnipeg School Division. The school, which went by several names including Normal School Annex, Tuxedo Normal School, and Tuxedo Model School, closed in the summer of 1953. The facility returned to its original purpose, functioning as a residence and school for deaf students from 1965 to 1996. It was used briefly during the 1999 Pan American Games before becoming part of Canadian Mennonite University. A plaque, dedicated in June 1996, is mounted near the east entrance of the school building at 500 Shaftsbury Boulevard. Source: Archives of Manitoba, George Harris Fonds, Acc. 1979-141, P7447, Album 4, Page 8. “Wing Commander H. B. Godwin takes over signals post here,” Winnipeg Free Press, 15 January 1941, page 8. “Two big Air Schools to be opened Monday,” Winnipeg Tribune, 11 February 1941, page 11. “Anzac Day parade set for Friday,” Winnipeg Free Press, 23 April 1941, page 16. “Record class of Empire airmen graduate from Tuxedo School,” Winnipeg Free Press, 5 July 1941, page 8. “Group Captain H. B. Godwin to take Ottawa position,” Winnipeg Free Press, 24 July 1942, page 4. “Wing Commander rank is given Michelson,” Winnipeg Free Press, 30 October 1942, page 6. “Change of command at Wireless School,” Winnipeg Free Press, 7 September 1943, page 4. “Grievances aired at No. 3 Wireless,” Winnipeg Free Press, 9 February 1944, page 1. “Air Force honors,” Winnipeg Free Press, 14 June 1945, page 2. “No. 3 Wireless School to close at end of year,” Winnipeg Free Press, 7 December 1944, page 19. “Notice to creditors [due to the disbandment of No. 3 Wireless School],” Winnipeg Free Press, 13 January 1945, page 16. “Transcona asks reopening of School for Deaf,” Winnipeg Tribune, 11 September 1945, page 9. “City grants use of Tuxedo School,” Winnipeg Tribune, 8 August 1946, page 2. “More teachers training now,” Winnipeg Tribune, 11 September 1946, page 13. “To join or not to join talks,” Winnipeg Free Press, 17 August 1949, page 7. “Model School mothers hold graduation party for students,” Winnipeg Free Press, 13 June 1950, page 13. Normal Lights - 1950 Manitoba Normal School. “Model School shows work to parents,” Winnipeg Free Press, 3 May 1951, page 3. “Model Principal honored by staff,” Winnipeg Free Press, 1 May 1953, page 11. Manitoba School for the Deaf, Manitoba Historic Resources Branch. Manitoba School for the Deaf students attendance registers (E 0839), Daily Registers, GR4117, Archives of Manitoba.